Professional mowers for a high quality finish. Suitable for Parks, Golf Courses, Playing Fields, Leisure areas and Amenity applications. Overlapping rotors ensure 100% cutting over the full width to produce a high quality professional finish. Fit the optional mulching kit for extra chopping and even spreading. Click here for more details. The Dynamo range are the only Finishing Mowers Built in Britain and come with a range of features to ensure good performance together with ease of operation and maintenance. Click here for more details. All models are shot blasted and have a high quality powder coat finish. Available in four cut widths from 1.2m, 1.5m, 1.8m to 2.45m. Suitable for Category 1 linkage. Front or rear mounting is possible by reversing the linkage frame and gearbox. All models are available with a mulching kit to produce extra chopping and even spreading. The kit comprises additional special mulching blades and housing enclosures to retain the grass until it is finely chopped. The optional overrun PTO is recommended when the machine is fitted to a tractor with either a braked or 'non-live' PTO. 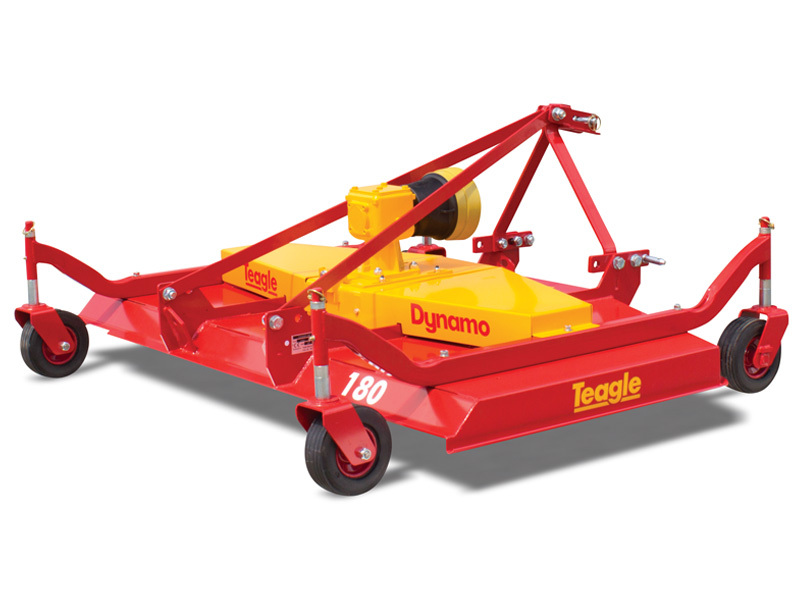 Teagle Grassland equipment is designed and manufactured using state of the art technology and represents the best in quality British agricultural machinery. Our Toppers incorporate high strength pressings and an impressive driveline and blade system resulting in a very robust machine. Suitable for agricultural pasture, playing fields, leisure areas and amenity applications. Robust construction - Superb finish. Suitable for parks, golf courses, playing fields, leisure areas and amenity applications.